— The United States Mint has revealed the design for its 2019 coin celebrating the roles of Native Americans in space exploration. The "American Indians in the Space Program" 2019 Native American $1 coin, to be released on Feb. 13, highlights individuals and achievements spanning the decades between NASA's Gemini program and the International Space Station. "Native Americans have been on the modern frontier of space flight since the beginning of NASA," described the U.S. Mint on its website. The 2019 Native American dollar, which is the 11th release in an annual series that began in 2009, retains the "Sacagawea" heads-side (or obverse) design — depicting the Shoshone interpreter who assisted the Lewis and Clark Expedition — first introduced by the Mint in 2000. The reverse, or tails design, prominently features Mary Golda Ross, the first known Native American woman to become an engineer. Ross' work for Lockheed Martin helped to advance the Agena rocket upper stage that NASA used for rendezvous and docking trials during the Gemini program. The mid-1960s tests were crucial to landing Apollo astronauts on the moon and later were applied to assembling the International Space Station. "Her achievements deeply impressed me and I was excited for the opportunity to tell her story through numismatic art," said science illustrator Emily Damstra, who the U.S. Mint chose to design the coin, in an interview with the Smithsonian's National Museum of the American Indian magazine. "From the beginning of my design process, before I had anything else worked out, I knew that my design would include a figure of her." Ross, who died in 2008 at the age of 99, is depicted on the coin as writing out calculations and is set against the image of an Atlas-Agena launching into space. An equation, which describes the energy needed to depart Earth and reach the orbit of another planet, is engraved in the rocket's billowing plume. Willis Jenkins, an engineer and program executive in NASA's heliophysics division, assisted the Mint in identifying an appropriate formula of the type Ross used when calculating interplanetary trajectories. 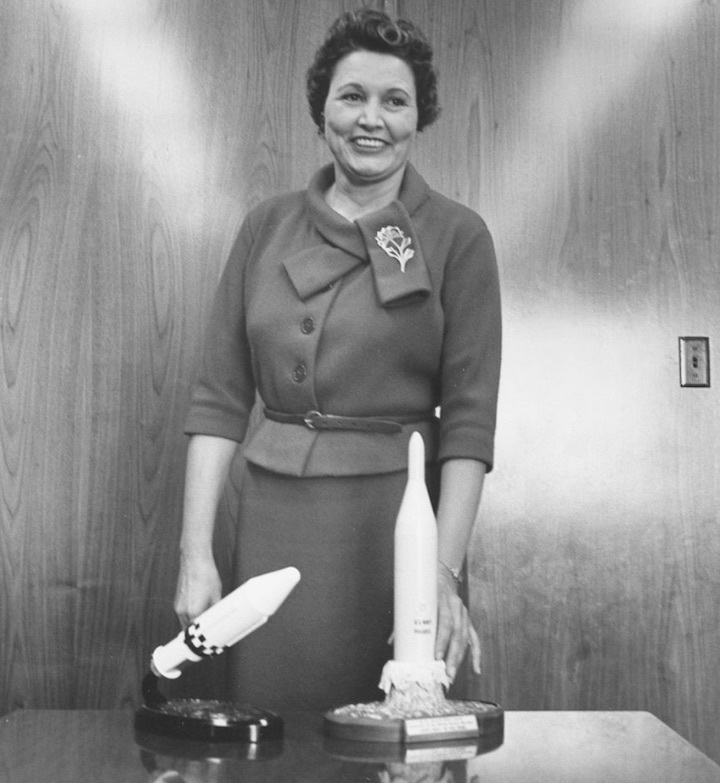 "Mary Golda Ross worked on designs for rockets and I have managed rockets in my career. Also, she was of Cherokee descent and I believe my mother's family is as well," Jenkins told Herman Viola, a senior advisor for the National Museum of the American Indian's Native American Veterans Memorial Project and a member of the Citizens Coinage Advisory Committee. The coin's third major design element is a spacewalking astronaut, which the Mint describes as "symbolic of Native American astronauts, including John Herrington." 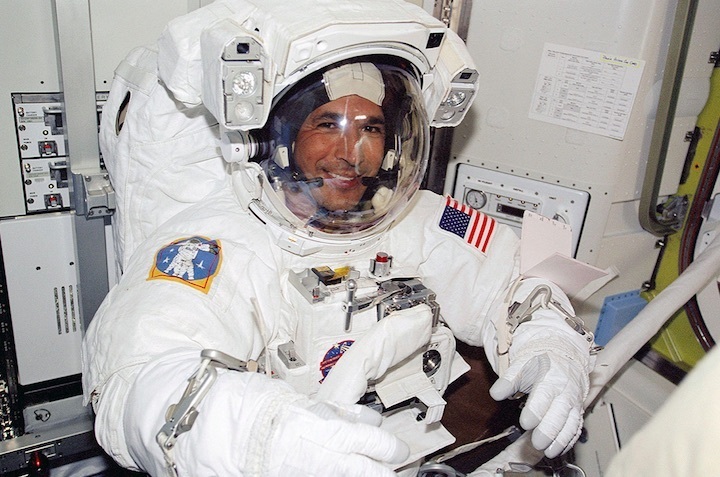 A NASA astronaut from 1996 through 2005, Herrington was the first enrolled member of a Native American tribe, the Chickasaw Nation, to fly in space. In November 2002, Herrington launched as a mission specialist on the space shuttle Endeavour's two-week STS-113 mission, during which he helped to install a new segment of the International Space Station's backbone truss on three spacewalks. 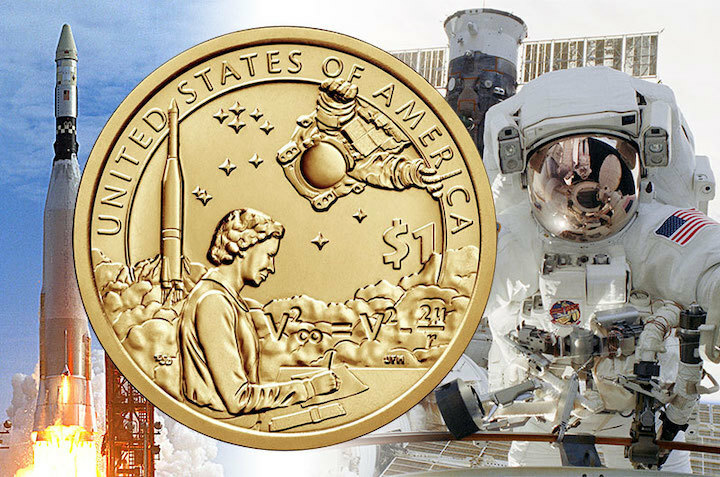 U.S. law prohibits living individuals from being honored on currency, which is why the astronaut on the 2019 Native American $1 coin is not identified as Herrington. "Though we don't see his face, the astronaut in my design is outfitted as John Herrington would have been for extravehicular activity," said Damstra. The late astronaut Willam "Bill" Pogue, who served on the third and final crew of the first U.S. space station Skylab, was of Cherokee and Choctaw ancestry. Unlike Herrington though, Pogue was not enrolled with a tribe. The "American Indians in the Space Program" 2019 Native American $1 coin will be offered by the Mint in proof, uncirculated, circulated and enhanced uncirculated finishes. The Mint produces the circulating quality coins as collectibles and though they are legal tender, are not intended for everyday transactions. The Native American $1 coin will be the U.S. Mint's second space-themed release in 2019. On Jan. 24, the Mint will issue commemorative coins celebrating the 50th anniversary of the Apollo 11 first moon landing.